Looking for answers to your questions? We've tried to answer as many as possible. Feel free to contact us if you do not see your question here. How are you different from other companies online? How can you be sure that your plans are better than the competition? What is your success rate of getting funded? Do we really get unlimited revisions? How does your sample plan compare to the competition? How long does it take to have a business plan completed? YES!!! What is most important to us is that you get funded! Why pay for a business plan if it doesn’t help you accomplish your goal of getting financing if we did not properly do our job? So we have decided to put our money where our mouth is and guarantee* that if you do not get funded because our business plan did not meet or exceed SBA guidelines, we will refund the cost of your business plan. If you are seeking funding from a Bank, SBA lender, Angel Investor, Venture Capital Group or any other lending institution, the chances are very high that they will require you to deliver a quality business plan. 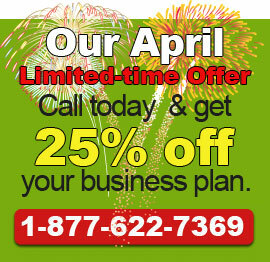 You can call us at Toll free: 1-877-622-7369 or email us at sales@smgbusinessplans.com. We produce the highest quality plans on the market, bar none. Additionally, our prices are at the least at the same level and in many cases lower than our competitors. You get a higher quality plan at a lower price. We are different in several important ways. Most of our writers are experienced and seasoned professional business plan writers AND experienced investment bankers with real world investment experience, not just writers. Also, we are committed to providing you the best business plan you could have so we strive to make the client happy no matter how much time and effort it takes. We work with you one on one after-hours and on weekends. Few companies give you that level of service. As former investment bankers, we have read thousands of business plans written by our competitors over the years. We know exactly how the other competitors write and what they provide in their plans and what they charge the customer. Comparing our work to theirs, we have a clear advantage and are able to provide consistently higher quality plans at a much lower cost. Most plans sell between $750-$10,000. We only require half or 50% to get started, the balance is due in 30 days or upon delivery of the draft, whichever comes first. Yes, we will work with you to accept a payment plan. Just let us know what your budget is what and what payment structure you would like and we will consider your offer. We accept all major credit cards including MasterCard, VISA, AMEX, and Discover. We also accept money orders, checks and you can even wire transfer funds if you prefer. Once we sign you up a as client, you will receive our welcome packet (via email) with our proprietary questionnaires, We then interview you as we go through the questionnaire to get all the pertinent information we will need for your business. Once this is completed, we get to work and can usually have a draft delivered to you in 3-5 business days. From there, you have unlimited revisions for 30 days. We guarantee that your business plan will meet or exceed all SBA requirements. We also guarantee that if a bank or investor ever comes back and states that you need to include more information for whatever reason, we will incorporate that new text or data at no additional charge. This is a very difficult one to answer because not all of our clients let us know when they get funded. However, with our Gold Plans last year, we collectively wrote plans asking for more than $300 million. Of that amount, our clients have received over $200 million in funding and many of others are in negotiations with potential investors. Yes, you get unlimited revisions for the 30 days after the draft is delivered. This is more than plenty of time to review your plan and request any necessary changes. First of all, the sample plans we send out are REAL plans that we wrote for our clients who have given us permission to show them. Most of our competitors will not send out real plans but instead a “mock up” version of a dummy corporation. This is not acceptable. Do NOT do business with anyone unless they are willing to send you actual work from one of their clients. If they state they cannot send you a real plan because of “confidentiality”, that doesn’t make sense if they have written thousands of plans and have happy clients. Every plan is different so it will vary. However, most plans are completed in 3-5 business days and we can also expedite your completion if necessary. Just let us know what you needs are and we will accommodate you. * The Money Back Guarantee is subject to the following terms and conditions. In the event that only an SBA approved lender sends a written request for additional information for the business plan, we must be notified in writing and given an opportunity to make the requested changes within a 30 day time frame from the time that we acknowledge receipt of said changes. If we fail to make the requested changes within a 30 day time frame, we will refund the full cost of the business plan. Change requests do not include specific financial projection(s) changes/updates and are limited to the scope of the level of business plan purchased and only reasonable requests will be considered. Any requests for additional information that exceed the scope of the category of business plan purchased, will be subject to an additional charge for the work requested. If the client refuses to pay the additional cost, SMG will have fulfilled its obligation and will not be responsible for any further changes. SMG does not make any warranties or guarantees that any of their business plans will be funded and is only responsible for making sure that the plan as written meets or exceeds SBA bank guidelines. For the purposes of this guarantee and all of SMG’s products and services, SBA guidelines are defined and limited to providing the following sections within each business plan: company description, market research or competitive analysis, financial projections which include Income/Profit & Loss Statements, Balance Sheet statements and Cash Flow statements, funding expectation (if applicable), client biography or previous work experience, client name and contact information. The following SBA bank guidelines guarantee is not applicable to work that is requested by SMG’s client that specifies a different or specific format that does not conform to the above. All of the work completed by SMG is for information purposes only and is not considered a solicitation for investment. SMG does not accept any responsibility nor is liable for any investments made or rejected as a result of any of their work. Please contact us if you have any questions. What Industry/Type of Business is this for? How much capital are you seeking from Banks or Investors? How soon are you looking to get started on your Business Plan?